Working for a startup in Ag technology means travel to much nicer places than when I worked in consumer electronics. Not that my Hong Kong session wasn’t special, but how can you beat a trip south of the equator in the middle of PNW winter? My first trip to Chile last season was all about work, as we were deploying early prototypes and I had little room for excess baggage. The systems for this most recent trip were shipped a month in advance, and we had little luggage for our long journey. But some of the components we brought for work did however need the extra safety of being packed in folded kites and in the pelican rifle case along with a foil mast. My colleague is a sailor, and had some experience with a power kite, so was desperate to learn. Loving waves, I wanted to hit Matanzas, on the Chilean coast a bit north of Santiago. But with cold water, fickle wind, and Pacific break, I figured that would not be a great place for him to learn. So a Chilean friend of mine pointed me to the Embalse Puclaro, a reservoir in the far north of Chile with strong steady winds and a small hotel on the shores. A few WhatsApp messages with the hotel managers, and we were booked with rooms and for my friend, lessons with “Max Power,” who we would later meet and determine to be the coolest kite instructor ever. My work was in the southern half of Chile, a similar latitude to San Luis Obispo, but on the other side of the equator. As we headed north, it was hard to get accustomed to drier, warmer climates… but alas that’s what happens as you get closer to the equator. At home, I’m used to it getting colder and wetter as I drive north. Round trip flights from Santiago to La Serena were only a couple hundred bucks, and if you arrive at check in less than an hour before boarding, they won’t charge you for your luggage because it takes them too long to process the payment. Pro tip. Booking with Hotel Puclaro, you have the option for an airport pickup at $40. Ben arrived in a big Dodge truck with plenty of room for the surf bag and foil box. We headed west from the airport, along a dry river bed and began to climb. There are vineyards everywhere, with the grapes used for both wine and the famous pisco liquor. The Ag in this region has been made possible by the Puclaro Dam, which as a welcome side effect made kiting this unbelievably windy valley possible. As you exit the tunnel adjacent the dam, you are greeted with beautiful blue water and desert looking mountains flanking the shores. There are cacti, and at first the region reminded me of baja. But the mountains are taller, it is surprisingly much more remote, and obviously a reservoir is much more contained than the Sea of Cortez. Driving around the lake, Ben stopped into the town to give us a chance to pick up some food for the week. With a shared kitchen area, no restaurant within walking distance, and all-day kiting, we loaded up with beef to grill @ $2.50/lb and lots of veggies, granola bars, and fruit. Breakfast and dinner for 5 days came in around $150. It was about 7:00PM when we arrived, and it was still nuking. I remember the stage in my kiting “career” when I would have run to the beach and pumped up even if it only got me 10 minutes on the water. But as I’ve matured and learned to appreciate the sport for other reasons, I opted instead to make some Pisco Sours and hang out in the common space to meet all the other guests. This included a windsurfing couple from Argentina, a family from Santiago, and a few younger couples some of which were in lessons. Even as the sun went down, in continued to blow. We grilled some meet and veggies, enjoyed another Pisco sour, but were surprisingly eager to get to bed in anticipation of a long day on the water. We’d have to save the wood fired hot tub for another night. Mornings on Embalse puclaro are absolutely perfect for foiling. There is about 2 hours of light wind, starting as early as 9 or as late as 11. You have the entire lake to explore, and on my first day I foiled up to the dam about 4 miles away. The turbulence from the dam sketched me out a little, and I could tell the wind was building, so I sailed back to the launch, just as everyone was rigging their 7m kites, but going out on twin tips. After a break, I joined them on a rented TT and had fun reconnecting to my freestyle days:) It reminded me so much of Sherman, with flat chop and warm air. Only instead of being one of the worst kiters, I was one of the better! There were so many people learning, it was actually quite amazing. A lot of lawn mowing as well, but the stoke level was high. I was completely lit on my 7m, the same kite I had foiled all morning. As I waited for the wind to calm in anticipation of a sunset foil sash, I didn’t realize how long I’d be waiting. At around 8:00 the sun dipped behind the mountain to the south, and the wind calmed barely enough for me to enjoy the foil. By 9, it was getting pretty cold, but still blowing hard. A Pisco Sour sounded pretty enticing, so after 20 minutes I decided to head in and warm up. Back at the hotel, Eric was celebrating his successful body dragging and already counting down to day 2 with Max Power. To be honest I too would be celebrating a successful body dragging in 30kts of wind! We poured some Piscola (Pisco + Coke) and hung out in the common space with our new friends. A generous couple let us try some Chilean delicacies, urchin and abalone. They even shared some wine from their friends Vineyard, but I don’t think they were too interested in our cheap pisco;) Having reserved the hot tub from 10-11, we finished finally warming up, and started cooking dinner around midnight. The next morning’s foiling wind came a little later, around 10:30. But I still had a nice 1.5 hour session before Eric’s lesson at 1:00 again in nearly 30kt winds. This time I retreated to the cube for a nap before returning to the beach around 4, still plenty of time for a two hour boost TT session. This time I would not go for the evening foil, but instead jockey for position in the kitchen. A nice group of young people from Santiago introduced us to their music and food. Most everyone spoke english, but it would have been wonderful to speak their language. With my brain full from a fading fluency in French, I cannot imagine learning another language right now! The gringos ate dinner long before the Chileans even finished cooking, but again we were pretty tired and eager to get out on the water again without the pisco hangover. We had to keep an eye out for a couple of the canines, who managed to sneak entire steaks of the plates of unsuspecting dinner guests. The next few days were basically on repeat: 2 hours of 7m foiling wind, followed by 8 hours of nuking twin tip winds. 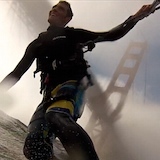 Eric progressed incredibly fast, and was fully self-sustained kiting on his 3rd day. The area was very conducive to learning, with steady winds, warmish water/wind, a fairly long launch, and competent instructors. The beach crowd was super nice, people regularly left iPhones, expensive gear, food and drink, simply sitting at the launch without a worry. Sun protection is pretty key, and the necessary 3/2 long wetsuit helps with that. But for your eyes, face, and hands, ample sun screen applications are critical. Back at the hotel, we enjoyed more dinners, hot tub sessions, and much needed relaxation in the cube. On the last night of my stay, I again retreated early in anticipation of a morning session before my afternoon flight out. At about 11PM, I was jolted out of bed when my water glass fell from the top bunk and the bed began to shake uncontrollably. Despite my cube being likely the safest place in Chile during an earthquake, I decided to heat outside in case anyone else needed rescuing from any debris or panic. Later did a learn, a 6.8 magnitude quake was centered only 50 miles to the southwest, resulting a much more violent vibration than the typical low-frequency tremors I grew up to in Seattle. Fortunately the dam held, so my morning session wasn’t interrupted:) We left a little early for the airport, given the rock slides on the road, which gave Ben and I chance to enjoy some much needed empanadas at a stand down the street from the airport. Final notes: At 155lbs I could have brought just my 7m. To be safe I brought a 7m and 10m, with which my foil and a rented TT would allow me to kite all conditions as there wasn’t much info online. But I didn’t use the 10m. Had I done it again, I maybe would have brought my 6m and 8m, as the 7m was a little small during the early half of the foil sessions. Plus who doesn’t want a little more boosting power? I could have foiled on the 6m, or smaller, the rest of the day. Definitely bring booties, the beach has rocks and they offer good sun protection. If you didn’t buy a BAK booicore, now’s your chance… it was awesome! I don’t know why the US is so far behind changing towels, everyone in Chile had one and it was a lifesaver. Hotel Puclaro rents a complete kit for $150/day, but let me rent just a TT for much cheaper. They have nice Cabrinha and Airush kites and boards. If you or your significant other needs to learn, this is an ideal spot with plenty of great instructors for $50/hour. The wind is extremely consistent, I don’t think you ever have to worry about getting skunked if you come during the summer. Apparently the winter winds are perfect for foiling all day. If you want more space at Hotel Puclaro, the cabins are worth it at $130/night. Or you can rent two cubes for the same price. The shared kitchen is both a blessing and a curse… the social hours are great, but sometimes ravenous kiters just want to eat. You definitely don’t need a car, but it would be nice to have if you wanted to make more trips to the grocery store or go out to dinner some nights. Most of the Chileans drove the launch from the hotel, but to be honest I enjoyed the 10 minute walk along the beach. What a great trip report. I really appreciate this. Awesome post. Looks like a fantastic experience with great people and great winds. Thank you for sharing. I'll put this place on my list. One question: is there reliable WiFi?